At Moray, in front of the largest group of circular depressions, is a rectangular building (apparently) which was divided into two rooms. The length of the smaller room is 20.75 feet. The length of the larger room is 34 feet. The length of the entire building is roughly 55 feet. 55/34 = 1.617. 34/20.75 = 1.63. 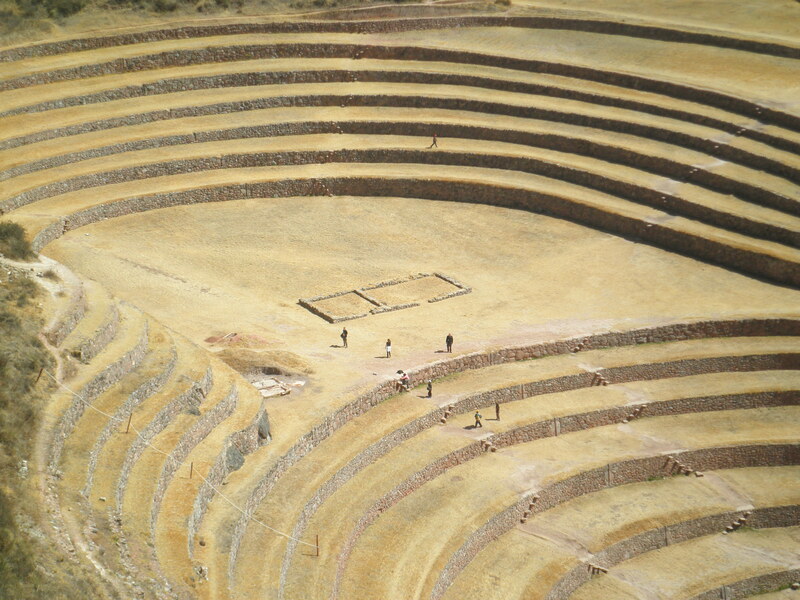 So, what looks like the ruins of an ancient building is actually a golden rectangle, laid out on the field in front of an enormous circular terracing system that archaeologists have no complete explanation for. I don’t have the time (or the technical expertise necessary) at present to fully work this out. The best I could do was create a golden spiral from said rectangle and see if that made any difference. 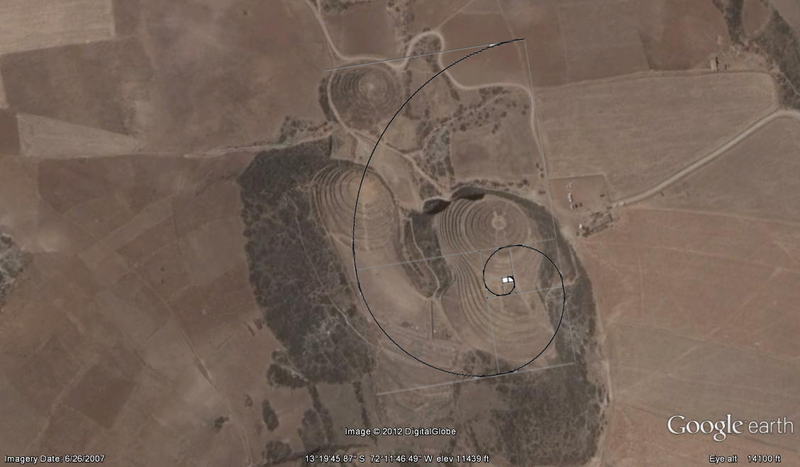 It does seem to describe the placement of the other two main circular formations, with the tail of the spiral going through the center of one and touching on the edge of the other. But that’s all I’ve got. Any geometers want to have a go at this one? The 20.75 feet is probably supposed to be 20.83 feet. If the 55 is accurate that would give 34.17 feet for the other room. The ratios you calculate would then be 1.61 and 1.64 respectively. Why these values? Observe 20.83 x 2 = 41.66 and this is 1/24 of 1000. In other words they used a 24 hour clock. 34.17 is 5.84 squared. Today we -should- recognize this as the circumference of Earth’s orbit around the sun at 584 million miles. The site does not easily depict a phi relationship because it probably depicts many, many concepts more advanced than that. Fascinating. The measurements could easily be off by such a small amount, as I was only equipped with a basic tape measure on site. Compelling conclusions. I’d be interested to hear what else you can come up with. Unfortunately, so little is left of this culture in particular, one hits a wall fairly quickly on subjects like these.